Oil on canvas, signed and titled on reverse. A Talented painter and sculptor, Paul Mount is better known as a sculptor, though he painted throughout his career he was also an architectural designer, novelist and a musician. Born in Newton Abbot, Devon in 1922, his parents were both teachers. He attended Paignton School of Art and later studied at the Royal Collage of Art until he was called up for war service in 1941. After the war he returned to the Royal College and in 1948 started teaching at the Winchester School of Art. In 1955 he took a position in Lagos, Nigeria helping to set up technical collage, it was here that he began to experiment with sculpture. After a while this resulted in a commission for a screen for the Swiss Embassy in Lagos, other commissions followed. By the time he returned to England in 1962 he was able to become a full time artist. He settled in Nancherrow near St Just-in-Penwith, Cornwall, where he spent the rest of his life. Mount conceived his sculpture in relation to the Cornish landscape yet his fascination for machinery led him to develop more angular forms.The distinction between Mount’s paintings and sculptures lay in the difference in the media, instead of being pictures of sculptures they aim to be a representation of space in its entirety. Either man-made spaces or landscapes broken into seemingly abstract planes, they stand alone yet there is a relationship in their styles. 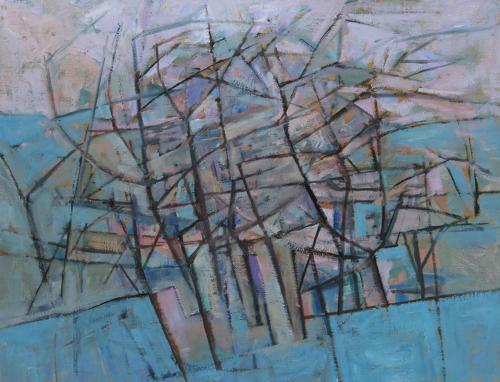 The painting here is an extremely good example, without a title ‘Mistral’ appears to be an abstract work yet with a title it comes alive as a tangle of trees with distant fragmented rooftops in the background. Paul Mount had his first one man show at the Drian Gallery, London and in 1975 a solo show at Marlborough Fine Art. He exhibited regularly in Britain and aboard for the rest of his career.